Xiamen, China: Checking Out "Xidi Coffee Street"
China is a country about tea. It is where tea comes from originally. I have recently read that after water, tea is the most widely drunk beverage in the whole world. Not surprising at all when China has more than a billion people. Well, I drink tea myself and billions of other people in Europe and Asia. Ever since the trade went global, as well still on-going economic revolution of China, many young local Chinese have hunkered for something new and hip to waste their time and money on. This something new and hip has long roots in the western world civilasation: Coffee. Enjoying a cup of double espresso and matcha cheesecake. The island of Skiathos is small and is just perfect to navigate around with a scooter (or a motorbike). You get rewarded with views like this when you explore the island. Because we both do not have a motor license, we were only able to rent a scooter up to 50cc. Skiathos, however, is a quite hilly island so we had some troubles scaling up the steep parts. A 50cc scooter cannot handle a steep incline with a second person on the back. Helaas, I had to get off and walk for the few meters. We cannot let the scooter choke to death. Even if I diet, I will still need to get off, haha. This is our last dinner in Skiathos Old Town. Skiathos Old Town and the island itself is lovely and very much a highly recommended holiday destination for us. We have enjoyed our stay here. The car-free Old Town is very pretty and traditional, filled with inviting boutique style stores and open taverna seating on cobblestone streets. Skiathos holds up to the standard of a charming Greek town on a Greek island. Dutchman and I went here twice! And that's a lot because there were many nice beaches in Skiathos. We liked the small and cosy location and the vibe of the beach. There is a trendy beach bar cafe and restaurant which owns a row of rental parasols and sunbeds. We love the music flowing from the bar cafe to the beach. What can you ask more on a summer beach holiday? Oh yeah, food! Of course. Another summer day in Skiathos Island. Infinity Blue Restaurant sits on top of a cliff. The island is very small. You can reach the other side of the island in half an hour with the scooter. I quite feel guilty about this blog. What do they say? Promises are made to be broken? But then again I do not mind posting late. Seriously, I actually feel the pressure of the mountain load of backlog posts I have. I really want to post more often, but.... *sigh* At this moment, it is what it is. So back to my 10th edition of My Daily Life in the Netherlands. It is winter season! The Dam Square and Dam Palace in Amsterdam taken in December. Lots of dinners at home during the cold months. The culprit: Real life gets in the way. Always. The Dutchman and I are also in a very busy period now with the house. It will only get busier because the house will be delivered in 2 weeks time. I am very excited! But I can also feel the enormous stress building up. Just thinking about the tasks at hand is overwhelming. Because we are not selling our current place (we plan on renting this out), we will have to do some renovations on top of the work that we will be doing for our new house. Plus we both work full time with demanding jobs. Luckily, we do not have kids. A blessing in disguise? Haha. This blog will suffer for sure. I am already missing it, seriously. I used to post regularly, like almost every day. Nowadays, I am super drained when I get home and I just can't focus on blogging. But I love blogging. I love journaling a part of my life and posting the pictures I made... so I will definitely keep doing this when I have the time. Nevertheless, here are some snapshots of my winter months: November, December, January, and February. Skiathos Old Town is one of the prettiest Greek town island centers I have visited. It is very charming and welcoming, and it is also quite hilly with great vantage points for views. Moi on top of the hilly old town of Skiathos. I took these photos in one of the hot summer afternoons on the island. I have just finished dipping in the pool and laying down on the sunbed to dry. The Dutchman lays beside me, very much engrossed with his new book called Judas, a real-life story of a high profile criminal in the Netherlands as told by his sister (whom he threatened to kill...). From time to time, the Dutchman dips in the pool too, to freshen up and take a breather from reading. Both of us take advantage of the summer holidays to read. I normally read at least 2 books on the 2-week holiday while Dutchman has a big stash loaded in his e-reader. I might just buy an e-reader when I get used to the idea. For now, I love the feel of the book in my hands. Dutchman and I were craving for some mixed grilled meat for this particular evening. We've seen these row of tavernas in the Old Town near the harbour. These are al fresco restaurants on a pedestrian street on the corner of the church with access to the harbour through a small slope street. This area has a good view of the water and Bourtzi Island as it is situated on a hilly part that overlooks the boulevard and the harbour. Octopus being dried on the harbour. This is one of our favourite beach chill days in Skiathos. Dinner at Salt & Pepper Garden Bar Restaurant. This is one of our evening walks in Skiathos and dinner on the harbour. Dining out during the summer holidays is something I always look forward to. It is like a treat. For this reason, I pick nicely situated restaurants with a good ambiance. Sometimes I check Tripadvisor for suggestions based on ratings and reviews. In the Greek Islands though, not all restaurants have their own websites, although the popular and bigger tavernas do have their own website or at least a Facebook page. But based on experience, we just tend to hit the town center and choose which one we like randomly. If I am craving for something in particular, then I would scan the menu first to make sure the place offers what I want to eat that evening. That simple really. 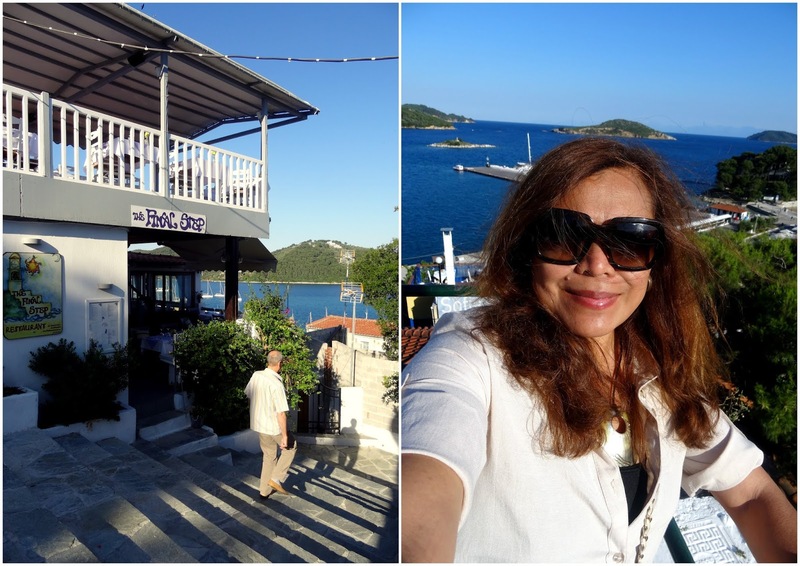 So I am backtracking to our summer holiday trip in 2017 to Skiathos, a Greek Island in the Sporades archipelago in the northern part of the Aegean Sea. I will be posting a series of blog posts for this holiday in the coming days. The island's resident cafe, restaurant, lounge and bar of the same name. The view to Bourtzi from the hill. Skiathos is a small and very pretty island, quite popular among the Greeks and European tourists, but luckily the holiday situation here hasn't reached the mass proportions of Santorini, Mykonos, Kos, and Crete. It has gotten famous in recent years though because of the Mama Mia movie which was filmed on set here. I have partly seen the movie on TV but it was after our holiday on the island. I have however watched a Mama Mia theater show in Utrecht, Netherlands many years before. Anyway, I wanted to blog about this charming tiny peninsula annexed to the old harbour and town center of Skiathos, the Bourtzi Islet. On our third evening in the Alps, we decided to have dinner outside in Lanslebourg village. Lanslebourg village in Mont Cenis (Val Cenis). The tiramisu that saved the evening's dinner. It's a Monday evening and many Mondays in the restaurant world is a rest day with kitchens closed for the whole day and evening. Last year we went out for dinner on a Monday evening in Les Champs, the small village between Lanslebourg and Lanslevillard, and the restaurant I had in mind was closed. There was another restaurant nearby with the tartiflette in their menu, something that I was craving for that particular evening. That restaurant saved our night. Well, I have a few restaurants in mind (thanks to Tripadvisor) so I am confident we will not be walking the chilly 2 kilometers to Lanslebourg for nothing. We decided to stay in Val Cenis ski resort for our second day of skiing and boarding. The advantage of skiing off-peak season is less human traffic on the slopes. We learned that our ski pass has a free upgrade similar to an Eskimo Pass. Because we have a 6-day ski pass, we are entitled to ski at the other 5 ski resorts in the Maurienne valley for 1-day each. Dutchman and I already planned to ski and board at 2 other ski resorts but for Monday, the second day of skiing, we decided to stay at our home base in Val Cenis. For this day, we planned on taking the 2 summits of Lanslevillard and Lanslebourg, the 2540m and 2330m. The next morning we woke up to a 3cm of snow. Not bad. We stayed at the CHG Residences & Spas - Le Chalets de Flambeau. The ski resort runners-up on our list were Les Portes du Soleil and Paradiski which are massive ski areas in the French Alps but with the combination of the right price and the accommodation on the piste or less than 100 meters walk to a ski lift, Dutchman and I ended up choosing Val Cenis again. We managed to snag a very good deal at CHG Residences & Spas at the Les Chalets de Flambeau which is between 2 ski lifts, the Pre Novel chairlift, and the Vieux Moulin gondola, both approximately 70 meters away. And from the slopes, you can ski down up to your door. Just perfect! The chalet apartments were also very nice, modern fitted and spacious. And here is the cherry on top of the icing -- free entrance to the spa. We cannot say no to that. Bonjour, Bonsoir from the Alps! Dutchman and I are skiing and boarding here in the Alps right now until the end of the week. We've had all kinds of weather this week so far... cloudy, snowy, misty and sunny. We can't complain really because last year's wintersports holiday we've only had one day of blue skies. So we are lucky this year. I will be updating the blog when I am back in the lowlands. So just a few photos!